Competition (2014), Nashville Philharmonic Orchestra Concerto Competition (2012), Vanderbilt Concerto Competition (2008), ASTA National Solo Competition (2007), and the Eastern Music Festival Concerto Competition (2006), among many others. 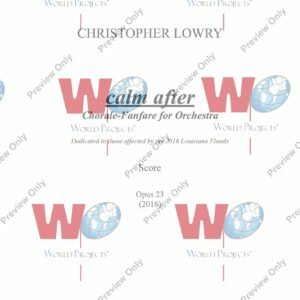 Recently, Lowry was a winner of the 2016 Oklahoma Youth Winds Composition Competition, 2016 Salford International Composing Contest, 2016 ABLAZE Orchestral Masters Call for Scores, 2016 Alabama Symphony Orchestra Call for Scores, 2016 BandWidth Music Festival Call for Scores, and the 2016 Missouri Composers Orchestra Project Composition Competition. 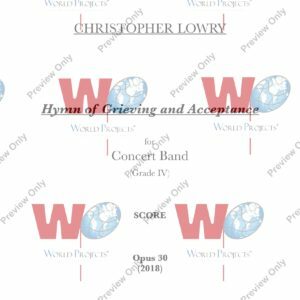 He also won second prize in the 2015 World Projects Composition Competition, and as a result, his orchestral piece Tranquillo, Opus 3a, was premiered in Carnegie Hall in June 2016. In addition, he has won awards in the NAfME Composition Competition (2015, 2012), Frank Van Der Stucken Composition Award (2015), the Nashville Philharmonic Orchestra Composition Competition (2015), and the Anton Stadler International Basset Clarinet Composition Competition (2010), among others. Lowry is equally active as a composer, soloist, chamber musician, orchestral musician, session musician, and recording engineer. He is currently Assistant Principal Violist for the Baton Rouge Symphony and Principal Violist for the Acadiana Symphony, and he is a founding member of the Ars Nova String Quartet. He has been featured as a soloist with the Lewisville Lake Symphony Orchestra, Louisiana Sinfonietta, LSU Symphony, LSU Philharmonia, LSU Camerata, Nashville Sinfonietta, Vanderbilt University Orchestra, Blair Reading Ensemble, Atlantic Ensemble, and others. He recently recorded Dinos Constantinides’s Grecian Variations for Solo Viola, LRC 106a with the Louisiana Sinfonietta for commercial CD release on Centaur Records. Lowry’s primary viola teachers include Elias Goldstein, Kathryn Plummer, and Mary Helen Law; his principal composition teachers include Dinos Constantinides, Michael Alec Rose, Michael Slayton, Michael Kurek, and Stan Link.